What do you know about chestnuts? You might think of the opening lines of The Christmas Song (“chestnuts roasting on an open fire…”). The song is a sure sign that Christmas is coming, but how many of us have actually eaten a chestnut? But our subject today is the chestnut in France–18th century France, to be specific. The Milwaukee Art Museum has in its collection a covered chestnut bowl and stand—you’ll find it in Gallery #8. In French, these vessels are called marronière, which comes from the French word for the high-quality sweet chestnut, marron. A marronière was used to serve marron glace, or chestnuts candied in sugar syrup and then glazed. The bowl has piercings that permit air circulation, which would help the chestnuts stay crisp and allow the extra syrup that is served on them to drip out onto the tray. Not only a tasty dessert, but a dramatic and decadent one! As you can imagine, this specialized bowl would be used by only the most well-do-to. Chestnut bowls were optional components for a dish service, and they were very expensive because it was difficult and time-consuming to fire bowls with elaborate piercings. In 18th century France, the most fabulous of marronière were made by the preeminent porcelain manufactory call Sèvres. Sèvres was the French competition for the Meissen factory in Germany. Founded in 1738 at the Château de Vincennes, it moved to the town of Sèvres (just west of Paris) in 1756. It was renowned for its high-quality porcelain, which was in great demand by the French court and the highest tiers of the aristocracy. In 1760, after it suffered financial difficulties, King Louis XV took control of the company and severely restricted the production of porcelain at other locations. His mistress, Madame de Pompadour, adored Sèvres and was instrumental in getting the king involved in the factory. Today, Sèvres from the 18th century is in high demand from collectors who appreciate its Rococo style epitomized by vibrant colors and elegant design, as well as its royal connections. The Museum’s chestnut bowl is an outstanding example for many reasons. The beautiful green ground—called vert, from the French word for green—is the perfect foil to the gilding that highlights the elaborate piercings. In the same way, the pristine white porcelain sets off delicately painted flowers, so indicative of the Rococo style. The painted and pierced decorations on the bowl and tray compliment the shape to create one harmonious whole. There are a few unique details that make this chestnut bowl superlative. For instance, the underside of tray is green. Because the bottom of the tray would rarely be seen, it was usually undecorated. It is clear that whoever owned this piece spared no expense! And then there is the chestnut used for the handle on the lid. Perfectly modeled, it gives a hint of the contents—which would have been a visual game appreciated by dinner guests. It is extremely rare and most likely would have been made only upon special request of the owner. By comparing it to other chestnut bowls, you can begin to see how extraordinary this one is. Here is one from a sale at Christie’s and a similar one from the collection of the MFA Boston. Art dealer Adrian Sassoon has one that looks more like a basket. The Getty Museum has a basket-shaped pair with phenomenal color and openings in a intricate pattern (but no chestnut handle!). A closer example is at the Detroit Institute of Arts, but again, it doesn’t have that charming chestnut handle. 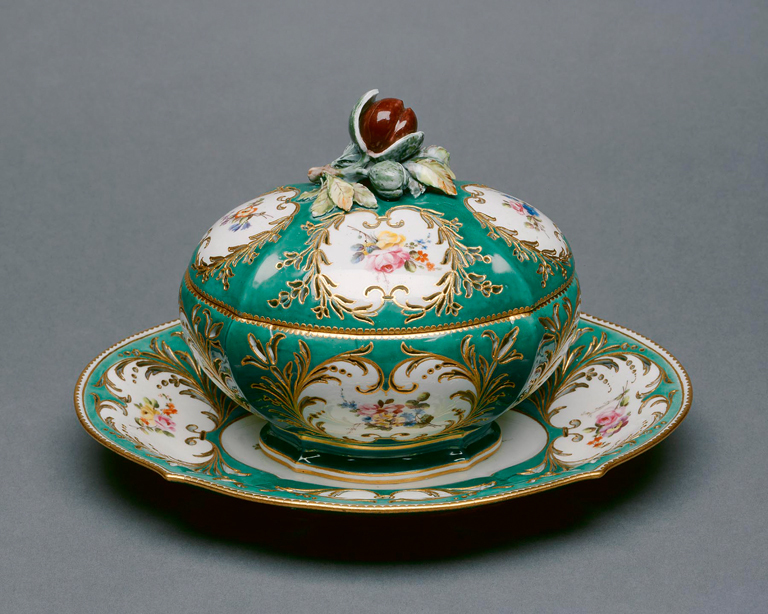 Our chestnut bowl is part of a small but superb collection of 18th century Sèvres given to the Milwaukee Art Museum by Milwaukeean Noryne Riebs. Mrs. Riebs was also a well-known collector of lady’s fans. Upon her death in 1958, both of her collections, plus a wonderful portrait of Charlotte-Françoise DeBure (which I highlighted in an earlier post) came to the Museum as a bequest. Mrs. Riebs was certainly on the look-out for the best: much of the Sèvres collection that is on display in Gallery #8 came originally from the collection of none other than J. Pierpont Morgan. Mrs. Rieb’s husband was Arthur J. Riebs, president of the Riebs Co., a grain merchandising firm. She was the daughter of a well-connected Oshkosh couple, C.W. George and Lillian Everhart. George Everhart had owned the Challoner Company, which made a number of types of machines, and he was also the president of Giant Grip Horseshoe Company. Thanks to the generosity of Noryne Riebs, our visitors can admire the rare and beautiful chestnut bowl—and wonder how candied chestnuts taste! This entry was posted in Art, Curatorial and tagged 18th century, 18th century france, chestnut bowl, Collection, marroniere, Milwaukee Art Museum, Rococo, sevres. Bookmark the permalink.